TEWKSBURY, MA -- The EHL team was back in action this past week, participating in a league-wide showcase in Newington, CT. The Rangers dropped the first game of the showcase, but rebounded on the second day with a win over the Philadelphia Revolution. Heading into the holiday break, the Rangers still sit in 2nd place in their division with a record of 17-8-3. On the first day of the December Showcase the Rangers squared-off against the Philadelphia Jr. Flyers, a team who they beat by a score of 3-2 just over a week ago. However, the boys fell behind early as the Jr. Flyers stormed out to take a 2-0 lead in the 1st half. The Rangers responded with two quick goals just 11 seconds apart near the beginning of the second half, as both Mitchell Haight and Conor Leonard found the back of the net. The game remained scoreless throughout the rest of regulation as well as the overtime period, and the Jr. Flyers ultimately took the extra point in a shootout. Billy Girard stopped 21 shots in the loss. 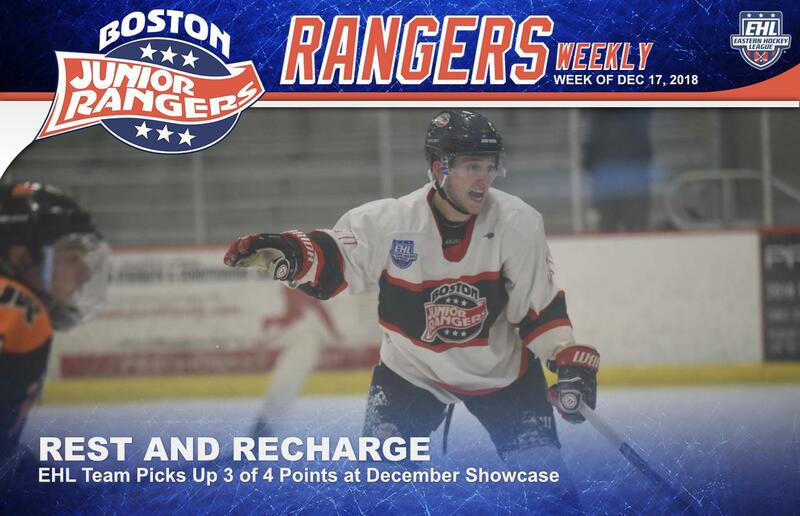 On the second day of the showcase, the Rangers faced-off against the Philadelphia Revolution. The squad got off to a slow start again as the Revolution grabbed the early 2-0 lead. However, Andrew Keith found the back of the net in near the final minute of the half to cut the deficit down to one. The Rangers tied the game near the 17-minute mark of the 2nd half, as Anton Metelev converted on a power-play opportunity. The game remained scoreless until the final minutes of the game when Keith notched the game-winning goal with just 2:07 left on the clock. The recent commit to SUNY Brockport, Aiden Curry, made 21 saves between the pipes. Both squads are back home for the holiday break as the each won't play again until the weekend of January 12th. That weekend, the EHL team will participate in another league-wide showcase in Walpole, MA, while the EHLP squad will face-off against the New England Wolves in Laconia, NH.